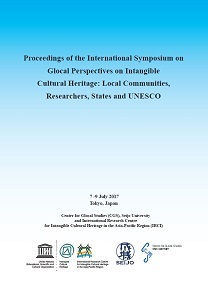 The proceedings of “the International Symposium on Glocal Perspectives on Intangible Cultural Heritage: Local Communities, Researchers, States and UNESCO” is publicly available on the website. The symposium held from 7 to 9 July 2017, was co-hosted by IRCI, Center for Glocal Studies of Seijo University and the Agency for Cultural Affairs, Japan. This proceedings includes what the specialists of Intangible Cultural Heritage (ICH) discussed in the symposium on the issues of safeguarding ICH at the level of each stakeholders, and the important cases to show how those stakeholders are involved in the process of the safeguarding. ※The PDF version has been added to the page of “Reports & Publications” and is available for download.